Haneda airport is the operations hub for 5 major airlines namely Air Do, All Nippon Airways, Japan Airlines, Skymark Airlines and Skynet Asia airways. It is located in Ota, Tokyo, and 14km south of Tokyo Station, the heart of Tokyo's transport system. Haneda airport is officially known as Tokyo International Airport. 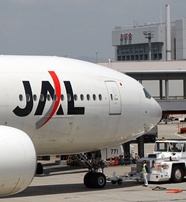 Its original primary role was to serve the Tokyo region and handle almost all domestic flights. It now shares that role with Narita International Airport which handles most international flights. Haneda airport is administered by Aviation Bureau, Ministry of Land, Infrastructure and Transport which manage the airfield, and Japan Airport Terminal Company ltd. which manages the terminals. Haneda airport first opened in 1931 on a small piece of bay-front land that is at the south end of todayâ€™s airport complex and was Japan's largest civil airport at the time. It was the main operating base for Japan Air Transport, the country's flag carrier then. It served as a US airbase during the 1945 US occupation and was at this time renamed Haneda Army Air Base. During this time the Haneda airport runways were extended to 1.65km and 2.1km. The base was handed over to the Japanese in 1952 when it was renamed Tokyo International Airport. Haneda airport handled its first international passenger flight in 1947 and began it first domestic flights in 1951. The Japan Airport Terminal Company was founded in 1953 to develop the first passenger terminal which opened in 1955. An international terminal was opened in 1963. Haneda airport has grown from then to have three terminal buildings as well as a VIP terminal. Haneda airport handled 62 million passengers in 2009 by throughput and is the second busiest airport in Asia. It is expected to handle 90 million passengers after ongoing expansions are through in October of 2010. Haneda airport is the third largest air cargo hub in Japan. The terminal is situated next to the Tokyo freight terminal and has scheduled cargo routes.